(2) Import: Transfer an existing podcast. Paste your SoundCloud RSS feed URL into the field and select Validate RSS Feed. The validation process will automatically validate the feed, show details, title(s), and artwork. After validation, the IMPORT button will display, click it to proceed, the process will now be underway. Take note, if you have a large amount of episodes, this process may take some time. However, your newest episodes will import first, so they are prepped and ready without much delay. 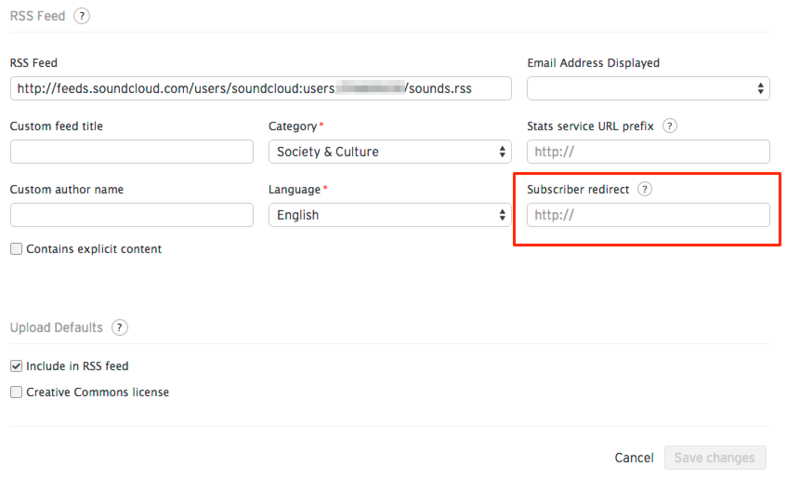 Next, be sure to redirect your SoundCloud RSS feed to Simplecast by going to your Content Settings page in SoundCloud and entering your Simplecast RSS feed URL in the “Subscriber redirect” field. SoundCloud will keep this 301 redirect in place indefinitely for zero cost. Unlike Libsyn and other services, SoundCloud will not delete your RSS feed. For reference, here's SoundCloud's documentation on this subject: "Redirecting your Soundcloud RSS feed to another host".